Samantha Spiro, David Troughton, and Amanda Root are among the cast of this new BBC Radio 4 dramatization of Jane Austen's famous novel. Mrs. Bennet is determined to see her five daughters married off and secure a future for them all. When the wealthy Mr. Bingley arrives in the neighborhood, Mrs. Bennet wastes no time in making his acquaintance. His friend Mr. Darcy, however, discourages Mr. Bingley from marrying Jane Bennet, and also appears to snub her sister Elizabeth. 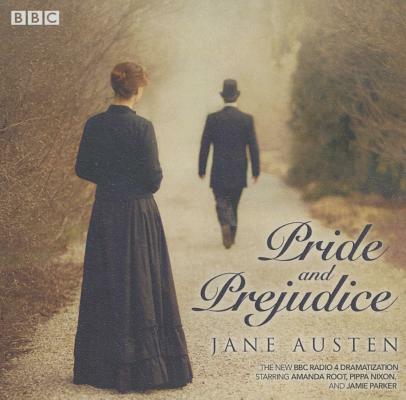 When Elizabeth hears that Mr. Darcy himself is of poor character, her innate prejudice of him is merely reinforced, and she roundly refuses his proposal of marriage. But then, when she discovers that she was misinformed, Elizabeth wonders if she can ever hope to see Mr. Darcy again. Published over two hundred years ago, "Pride and Prejudice" remains one of the British nation's favorite novels. Among the starring cast in this radio production are Pippa Nixon as Elizabeth and Jamie Parker as Mr. Darcy.